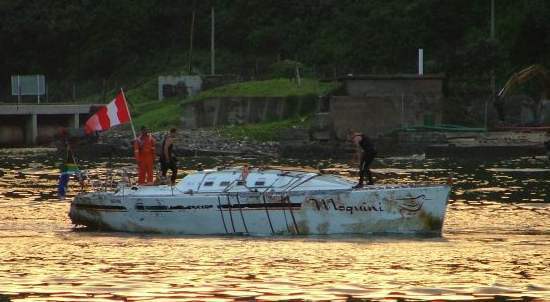 The South African yacht Moquini which went missing with all her six crew in September 2005 has been found floating upside down 500 nautical miles off the notorious South African Wild Coast. 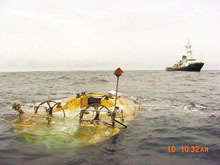 The upturned vessel was spotted on Sunday 5 February 2006 at 10h49 UTC in a position of 33 32 south and 38 21 east by Patrick le Masson the Master of the Mt Algarve (Motor Tanker). This information was immediately transmitted to the MRCC (Maritime Rescue Co-Ordination Centre) in Cape Town. The MRCC immediately requested that the Mt Algarve stand by the vessel to establish a drift pattern. Despite tight deadlines the ship�s owners agreed and the MT ALGARVE stood by for 12 hours, relaying the drift pattern to the MRCC. The MRCC also sent an SAAF search and rescue aircraft out yesterday (Tuesday) to obtain a position, and have done the same today when they located the upturned vessel and directed the salvage tug to the casualty. There is also a fishing vessel in the area which has offered its assistance if needed. The MRCC immediately dispatched a salvage vessel, the Smit Amandla, to the area. The SMIT Amandla has divers aboard who were able to inspect the hull and positively identify it as the Moquini. Moquini is a sorry sight as it is completely inverted with the rudder and engine�s sail drive unit in their normal position - although the keel is completely missing. The big question is what happened? And in the very short time available between the keel coming off and the boat inverting, they may well not have had the time or ability to launch the life raft. Plus, whether the crew were wearing lifejackets or not, it would have been almost impossible for them to stay close to the boat as there is nothing for them to hold on to on an upturned slippery hull. If conditions were relatively calm and the wind not blowing too hard, the yacht would also have had some hatches open, and these would immediately have caused the vessel to fill with water. It will take some investigation to determine whether Moquini hit anything, causing the keel to come off, or whether it was a catastrophic failure. At this point it is pure speculation as to when the incident occurred. If it happened when the single blip from the EPIRB was transmitted on Friday morning 16 September last year at approximately 03h40, it would have been dark, and difficult for anyone to locate the EPIRB in the cabin and set it off. However, knowing that the keel was off, may explain the single blip from the EPIRB, as an EPIRB will not transmit when more than half a metre below the water - and with the boat completely capsized it would have been under water. A mould maker who repaired the doomed Moquini before it set off on the Mauritius to Durban yacht race told investigators into the tragedy that he had warned the owner and the builder of the vessel against sailing in those waters. He said he "would not be happy to go on the boat as the bottom of Madagascar is not a nice place, it is a lousy piece of water and has big holes", Mel Hickman is quoted as having told the yacht's owner/skipper, Graham Cochrane, and its builder, Neil Tocknell, in a preliminary report by the South African Maritime Safety Authority (Samsa). The report was leaked to the Sunday Tribune this weekend, just over a year since the yacht sank after a single distress signal was detected, launching a massive search. Family memorial notices were carried in the Sunday Tribune last week marking the anniversary of six deaths aboard the racer. The yacht's last positional report from the satellite tracking system put it about 16 nautical miles off the south eastern tip of Madagascar. The probe into the mystery of what sank the Moquini with a highly-experienced crew has uncovered a litany of procedural irregularities as well as alleged problems with construction in the keel area of the yacht. These findings are included in the long-awaited Samsa report which has been kept under wraps since it was completed earlier this year. The hull of the yacht was found floating off the Eastern Cape's Transkei coast five months after the Moquini vanished, but without a keel. The Moquini was skippered by Cochrane. Other crew members were Sheldon Dickerson, his cousin Mark Dickerson, Kurt Ostendorf, Michael Goolam and Tocknell. They were never found and have been officially presumed dead. Now the Samsa report, while not finding a single cause for the yacht to have lost its keel, sheds new light on a chain of errors that the report says might have contributed to the dramatic tragedy. The report says that while it is evident that the loss of the yacht's keel caused it to capsize, no specific cause for the failure could be identified. The yacht probably did not sink as a result of hitting a submerged object - theories of submerged shipping containers abounded at the time - and there was also no sign of either an explosion or a fire on board, the report said. --non-conformity to design specifications, and "poor workmanship". The investigators asked the then Durban Institute of Technology to survey the hull and this revealed alleged discrepancies between the design of the yacht and how it was built. The DIT reported that visual inspection and wall thickness testing showed, in the area of the keel, that the yacht did not conform to design specification and "the workmanship is appallingly substandard". The DIT expressed the opinion that it was extremely likely there was a small through-thickness crack or flaw in the laminate at the port edge of the keel fixing plate. It would have been initiated if the keel had struck something prior to the race or due to a manufacturing error. The crack would open and allow water to flood the floors, girder and the interior of the vessel. An oblong hole was found that might have been drilled to pump out water. "In harbour the crack would close as the sailing loads are removed making it difficult to spot and it would not leak water. During the race, once the crack was of a critical length, either a wave or a glancing blow to something solid in the water caused the final rapid failure of the remainder of the laminate and at that point the keel dropped off. It is unlikely the yacht hit a container... because there would be damage to the hull elsewhere," the DIT study found. The Samsa report pointed out the yacht was, in fact, taking in water when it sailed to Mauritius to start the race and it had been involved in a prior minor collision with a vessel called Gumption and then repaired. The report noted that, in contravention of the Merchant Shipping Act, Samsa had no record of this collision. The builder of the yacht, Bill Tyler, was a business partner of Tocknell, one of the crew. He told investigators the yacht would float if it lost its keel and he and Tocknell had examined the boat in Mauritius and there had been no signs of any stresses. So far 35 yachts had been built with no comebacks and there had been no prior problems with the Moquini. The Samsa report outlined several discrepancies noted in the course of the investigation - including that the South African Sailing (SAS) surveyor who had initially inspected the Moquini for safety and registration reasons was not suitably experienced or trained. The report said the inspector had not used the correct checklist and did not know several key things. Critically, he also did not understand the importance of a hull inspection and no records of the inspection appeared to have been kept. The report said the yacht had not been taken out of the water for an external inspection and there was no evidence a separate hull inspection had taken place. Then it appears the registration process was completed before all checks and relevant documents were completed, and the vessel was cleared to leave South Africa without the right documentation. The report said the yacht had been registered despite the fact there was no Samsa Local General Safety Certificate or a radio station licence. The emergency positioning indicating radio beacon (Epirb) which transmitted the single distress signal from the yacht was registered in the name of another yacht, Cracker Jack, in contravention of merchant shipping regulations, and this caused confusion. It appears the life raft and Epirb were stowed under deck and the report said it would have been prudent for them to have been more accessible. No trace of the life raft was found but emergency water ration packs were discovered and the report said it was possible the life raft container was broken open. "The detachment and loss of the keel caused the vessel to capsize rapidly and this would be followed by a large ingress of water. If this happened at night, this would have severely restricted the ability of the crew to abandon the vessel and deploy the raft and Epirb," it said. The investigators said a collision with a submerged object would have caused more damage to the hull than shown by the Moquini. Their recommendations include that hulls of small vessels - in addition to the decks - be painted in a colour that makes the vessel easily visible from above - unlike the blue and black of the Moquini. The report said, "It is strongly recommended that all similar yachts be examined as a matter of urgency in way of keels in accordance with recommendations from the designer and that special attention be paid to the keel arrangement. Additionally, the keel studs should be tensioned to torque parameters set by the designer and carried out to ensure equal loading and measures taken to lock the nuts after tensioning." Samsa's head, Saleem Modak, was out of the country and Samsa said there was no way to contact him about the report. However, it is understood Modak has recommended no further action be taken in terms of legal proceedings but has compiled a list of corrective measures. Some of these measures are apparently to be implemented within weeks.